Rejoice! Glade season is here which means it's time to get ready for winter! 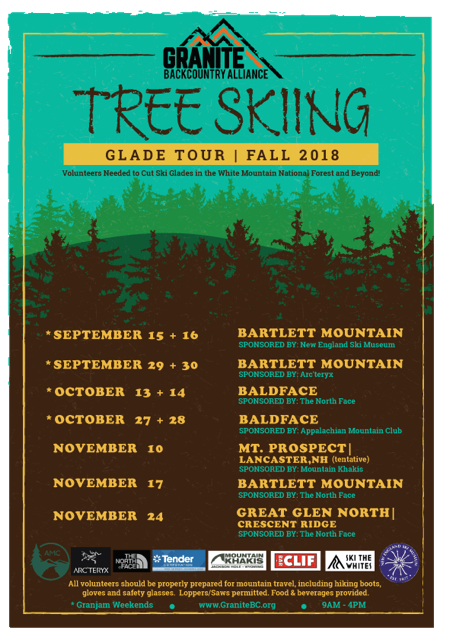 What better way to prep than join GBA this fall on its glade tour of two White Mountain National Forest projects as well as State of NH project on Mt. Prospect in Lancaster and maintenance in Crescent Ridge Glade and Great Glen North glade. It's time to roll up the sleeves and commit! Please Note: The September 15/16 event will be held at Baldface, NOT Bartlett due to a last minute switch related to some additional permits required to glade. We've created a moderately aggressive glade tour this fall because WE THINK QUARRY DOGS WILL BE INCREDIBLY PRODUCTIVE AND MOTIVATED! With a vast amount of terrain at our fingertips, all approved and flagged, together we simply need to create space in the woods. It's a beautiful thing! Our goals for 2018 are to make significant headway in our two most exciting projects in the White Mountain National Forest. From a numbers perspective, we'd like to add approximately 10,000 vertical feet of skiing to our backyard. We also have unique opportunities to develop Mt. Prospect in Weeks State Park (NH) in Lancaster as well as expand and fine tune Great Glen North (Bill Hill) and Crescent Ridge Glade. Just think about that vertical we can add to the backcountry scene this fall - so get your friends, sisters, uncles, bartenders, teachers, merchants, zoo keepers and put them to work! Volunteer! That's how you get involved and make the biggest impact. Grab your hiking shoes, a pair of gloves, sunglasses or safety glasses, pants and a backpack with some essentials such as water and first-aid kit. If you have any non-motorized tools you may bring them, such as loppers, hand saws, and pole saws. We'll provide breakfast, lunch and dinner, although it is recommended you come prepared with your own food, too. Volunteers will be broken into groups led by Pack Leaders who will be your mountain guide for the day. Packman (or woman) will have knowledge of the project and the WMNF requirements so please listen to your Packman! We have a plan in place and Packmans help us manage the day and accomplish our goals. With so many volunteers management can be a challenge! For each full day of work, every Quarry Dog receiveds one free entry into a free getaway package to Boulder Hut Adventures. For two days of volunteering, you'll earn a free GBA membership! We'll also have sponsors from each weeeknd kick into a free raffle so we'll have sweet swag at night. We'll post a schedule of where we're meeting up at night. Bartlett Mountain will be the first glade zone we will attack this September. We have five days scheduled here during the month so we'll have a good idea of the progress by October 1. The goal is to implement 4 glade lines and two skin tracks for the upcoming season, as well as develop a parking lot, signage and maps. This is a big and exciting zone with a total of 2,100 vertical feet top to bottom. It will be worth it! Baldface represents another giant project - nearly 600 acres of terrain to work with. It's not so easy - we are working with difficult terrain. Our goal is to cut 2 lines top to bottom with several off-shoot glades. One will go into slippery brook whereas the other will be below the prominent middle ridge line. 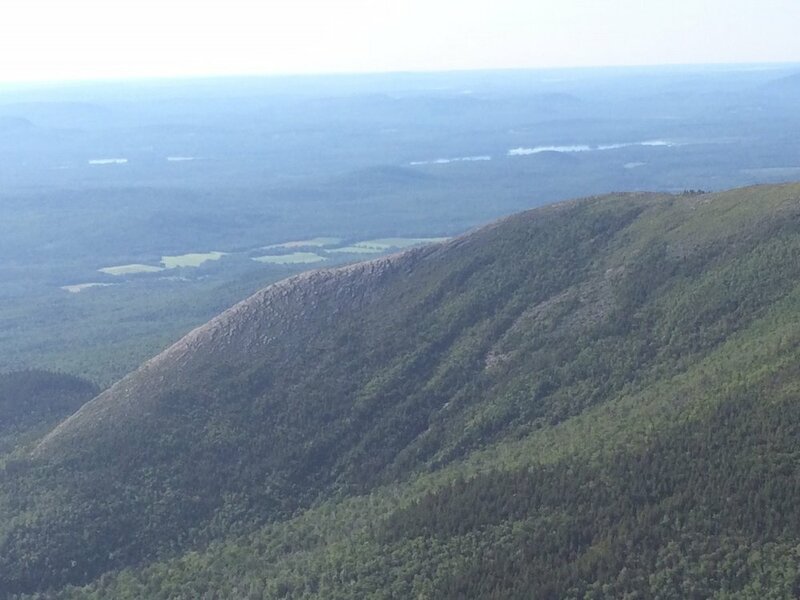 The exciting terrain off the Knob will provide excellent trajectory into the glades. This is an exciting project. We are hoping to obtain approval to glade Mt. Prospect this fall. The hill currently supports the Mt. Prospect Ski Tow. We are hoping to enhance the community ski hill experience and use this as a pilot project to determine if community hills are a good place for GBA. Right now, we think so!